Douglas P. Adams received his Bachelor of Arts from California State University, Sacramento in 1980 and his Juris Doctor from University of the Pacific, McGeorge School of Law, in 1984. He is a lifetime member of the Traynor Honor Society, earned the American Jurisprudence Award in Remedies, and was awarded the Raymond Biele Scholarship. Mr. Adams has been rated by members of the bar and judiciary as having the highest levels of skill and integrity (AV). His recognized skills as a trial lawyer have earned him election into the American Board of Trial Advocates (ABOTA). He serves on the Board of Directors for ABOTA on both the national and local level. In 2015, he served as President of the Sacramento Chapter of ABOTA. 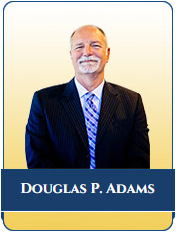 Prior to entering private practice, Mr. Adams worked in the Sacramento County District Attorney’s Office for 13 years. From 1977 to 1984 he served in the Bureau of Investigations. From 1984 to 1990 he served as a Deputy District Attorney, during which time he tried in excess of 50 jury trials. A lifelong interest in sports has led Mr. Adams to expand his practice in to sports law. He was certified as a contract advisor by the NFL Players Association and represented college and professional coaches. Mr. Adams has successfully completed appellate mediation training required by the California Court of Appeal, 3rd District. Thus, he has qualified for the court’s mediation panel and is mediating cases that are on appeal from the trial court. Mr. Adams is a member of the State Bar of California, American Board of Trial Advocates, Sacramento County Bar Association, El Dorado County Bar Association, and previously was a member of the Northern California Association of Defense Counsel, and the Northern California Fraud Investigators Association. He is admitted to practice in all California courts, United States District Court, the 9th Circuit Court of Appeals, and the United States Supreme Court. He serves as a Pro Tem Judge in Sacramento, Placer and El Dorado Counties, and as an arbitrator/mediator in Sacramento and El Dorado Counties. He also serves as a mediator for the California Court of Appeal, 3rd District. In previous years, he has been an instructor in Tort Law for the Paralegal Program at the University of California, Davis (extension) and has served on the Board of Directors for both the Rancho Cordova Chamber of Commerce and the C.S.U.S. Stinger Foundation. Mr. Adams resides with his wife, Melanie, and their two sons in Rancho Murieta, California.